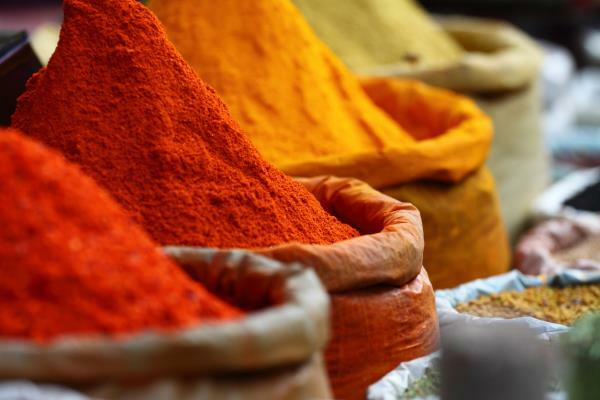 Spices are widely used throughout the Mediterranean, reflecting a strong multi-cultural, and particularly Arab, influence. Spices have been used to treat and cure a wide variety of ailments. For example Saffron, which per gram is more expensive than gold, has strong liver-protective and anti-cancer properties. Here we will talk about just three. Turmeric, with its yellow pigment curcumin, is the underground stem of a tropical perennial that grows in many hot countries. The stem is a light brown colour on the outside but, when ground, produces a bright yellow powder. It is a common component on the Southern Mediterranean shores. It is the single most researched compound in the world – with strong anti-inflammatory benefits. It is a powerful antioxidant and is known to boost glutathione levels and prevent liver damage. It has proven antimicrobial powers often being used in local recipes around the world along with meat that is slightly ‘off’. However, these properties have resulted in its use in treating colorectal cancer, and it is known to improve the effectiveness of certain drugs while at the same time protecting healthy cells. Fresh ginger is often recommended to relieve symptoms of nausea – some people chew a slice, or grate it to make a hot drink. It has major benefits as an anti-inflammatory and is anti-microbial. Preliminary studies at the American Association of Cancer Research have shown that gingerol – an active ingredient in ginger – may halt the growth of colon cancer, and it is effective in killing yeasts and microbes. Research has seen it used with breast and prostate cancer, and in 2015 research showed that ginger helped normalise blood sugar levels.